What is an RS America? For more RS America Press releases go to the OEM info/Factory data page. The original 1973 Carrera® RS was available in Europe but unfortunately not in the USA. Porsche® decided to build the 1993 Carrera® RS both to European spec and a limited number in compliance with US regulations. These US spec cars were assigned the name “RS America”. The intent was to create a basic lightweight, no frills 911 with minimal luxury options. Fitting the RS America with the M030 sport suspension package, which included the use of much of the running gear from the 911 C2 Turbo, led to higher performance limits. The Turbo's progressively wound coil springs, larger diameter front stabilizer bar, and upgraded shock absorbers were standard equipment for the RS America, as were 17” diameter C2 Turbo wheels. 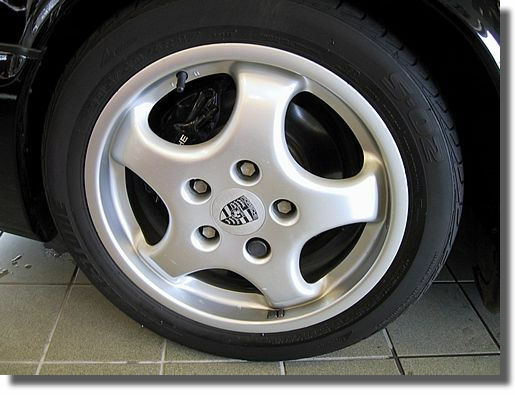 The RSA rims were 7” wide on the front and 8” wide on the rear (as opposed to the 7” wide front and 9” wide rear wheels of the C2 Turbo). “Mille Miglia Cup I” wheels were stock rims for the RS America. (click on the image above for more data on RSA wheels). Due to larger than expected customer orders, Porsche® continued building the RS America through August 1993 and therefore, 84 of these “1993 model year only” cars were not released until 1994. Interestingly enough, the 1994 models all differed from the 1993's by having “RS” in their Vin number (as opposed to the “PS” of the 1993 models) [show me] and by having rear seats fitted [show me] in place of the dual storage bins that were standard on '93 RSAs. Fred Schwab - President & CEO of PCNA 1992 - 2003. “If you like to autocross, this is your car. If you are a time-trialer, you need this car. Warren G of CA's color-to-sample one of a kind Maritime blue RSA. To find out which of the four options an RSA was fitted with when it left the factory, you need to check the cars ID label which has the three-digit codes for each option as listed above printed on it. The ID label is located in two places, one is on the underside of the front hood behind the latch and the other is on the first page of the Maintenance manual. The ID label is underneath the hood, just behind the latch. The option codes are at the bottom of the ID label and usually start with “C02” which means fitted with a catalytic converter (see sample ID label shown below). Occasionally option code “C36” is present and this indicates that the car was originally delivered to Canadian spec with the speedometer graduated in kilometers per hour and labels on the car were in liters rather than gallons. Although the description of option “331” states “Cassette radio with 2 speakers” all RSA's were fitted with two door speakers, a windshield antenna, antenna signal amplifier and associated wiring - for this option it was actually only the Porsche CR-1 radio/cassette in-dash unit that was added. The ID label located on page 1 of the Maintenance manual. For more information on option codes found on RSA ID labels, go to the Frequently Asked Questions (FAQ's) page. There were also two metallic colors available for an additional $1,036. Additionally, it was possible to order your RSA in any color you specified - this was referred to as “color to sample” for an additional $2,498 irrespective of whether the color you specified was metallic or non-metallic. All interiors were black with black cord fabric covered sports seats as standard [show me]. It was possible to order the seatbelts and webbing door pull-straps color coded to match your cars exterior. The interior door panels comply with the weight saving theme in that they were devoid of the armrest and door pockets that were standard on C2 and C4 911's available in '93. Instead of a complex opening mechanism the RS America simply had a webbing strap in a loop that you pull to open the door. 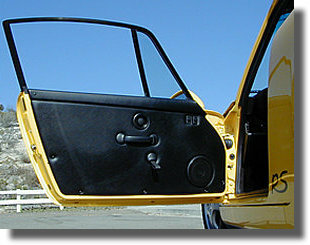 In order to meet type certification requirements in 1993 RS America came with electric windows (the two rocker switches on the drivers door are visible top right of the panel pictured). The significantly lighter manually cranked windows were not used because the car would need to be re-certified in this configuration which would involve embarking on an expensive and time consuming crash test campaign. Red seatbelts and webbing pull straps for opening the doors were a popular choice for Guards Red and Black cars, with blue belts and straps being fairly common on Polar Silver models. The easiest way to recognize an RS America is that it is the only 964 series 911 fitted with the large fixed rear spoiler or “whaletail” as opposed to the regular 911 C2 or C4's moveable “letter box” type motor-driven spoiler that mechanically deploys and stows depending on vehicle speed. Additionally there is an “RS” decal in front of each rear wheel well at the aft end of the door sill and of course the RS America rear deck lid emblem. When the cars were delivered to the US, the RS America emblem and side decals were shipped loose in the glove compartment and dealers were given an instruction sheet showing to how to correctly locate the emblems and decals on the car if the owner requested them to. Consequently, not all RS America's are fitted with model identification emblems on the rear deck or “RS” decals on their flanks just aft of the doors. When the RS America was introduced it was the cheapest 911 available and sold for $10,000 less than a fully equipped C2. Ironically, nowadays the market value of an RSA is $10,000 higher than a C2 in similar condition with similar mileage. To read an article published in April 2006 in the Porsche Club of America national newsletter “Porsche Panorama” entitled “What exactly is an RS America?” click on the above image.